When is the best time of year to come to Maui? There is no best time of year to come to Maui, but different times of year have different opportunities, costs, and somewhat different weather. Let your preferences be your guide. One of the great attractions on Maui is whale watching. The whales start arriving in late October and November and are present in their thousands sometime in December. The most spectacular displays are usually in January, February and March. You can see impressive sights from shore, and even more amazing views on a whale watching cruise. The HIGH season runs from a few days before Christmas until spring vacations for schools and universities. Most accommodations, including ours, are more expensive during high season. An even higher premium is charged for the days around Christmas. The spring and fall tend to be quieter times. There is more room on the beaches, in restaurants, and at tourist destinations. There are more families with children in the summer. The average high and low temperatures near sea level vary by less than 10 degrees over the course of the year, but the extremes in summer are hotter than those in winter. You’ll see local school kids waiting at the bus stop bundled up for the “winter” weather when morning temperatures are in the 60s. Water temperatures change even less: the average low water temperature is in February and March at 74 degrees Fahrenheit; the average high (in August/September/October) is 79/80 degrees. Rainfall is a different matter – both by time of year and location. 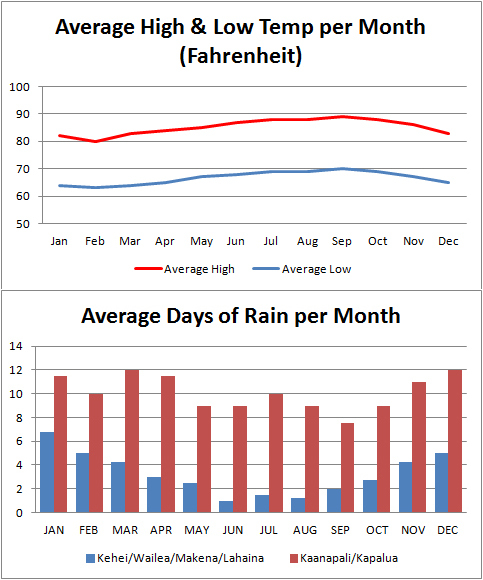 Every month the average number of days of rainfall is less on the south coast of Maui (Kihei, Wailea, Makena) than in the northwest by Kaanapali and Kapalua.